If your foot or ankle arthritis is disabling, and other treatments aren't helping, your doctor may recommend surgery. Surgery for arthritis is done by orthopaedic (bone) surgeons. The type of surgery will depend on exactly where the arthritis is, what type of arthritis it is, and just how it is affecting your joints. Your surgeon may recommend more than one type of surgery. They will talk with you about details of the surgery, its risks and benefits, and what to expect when you are recovering. Keyhole surgery (also called an arthroscopic debridement) is often used in the earlier stages of arthritis. Debridement means cleaning, and removes any loose cartilage, bone spurs, or other tissue from around the joint. This surgery usually helps to improve your mobility, but your arthritis is still likely to continue getting worse. If your arthritis has progressed further, surgery will usually involve fusion (also called arthrodesis). This surgery fuses the bones of the affected joint, making two or more bones into one continuous bone. It aims to reduce pain by stopping any movement in the arthritic joint. During fusion surgery the surgeon removes the damaged cartilage and then uses pins, plates and screws, or rods to fix the joint into a permanent position. Over time the bones fuse, or grow together, just like the two ends of a broken bone grow together as it heals. While the main aim of this surgery is to reduce your pain, it can sometimes improve your mobility. Some people find the metal used in the surgery can be quite irritating, often when they are wearing particular shoes. If this happens to you, talk to your surgeon about another operation to take the metal out once the bone has healed. This usually won't be done until at least 12 months after the original surgery. 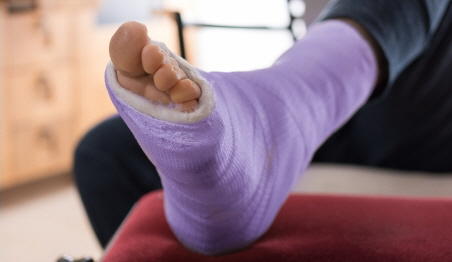 After surgery you will usually have one night in hospital, followed by up to six weeks in a cast or moonboot. You won't be able to drive while your leg is in a cast or moonboot. You will have physiotherapy to strengthen your ankle and get it moving again. You will need to use crutches to get around, and won't be able to put any weight on your ankle and foot for some time. Your surgeon will talk to you about this before your surgery. After surgery you will need some time off work – how long depends on what your job is and whether there are any light duties you can do. As you recover you will have regular appointments with your surgeon, and some X-rays, to make sure the fused bone is healing well. While surgery will probably reduce your pain and make it easier to walk, it might not change the way your foot looks. You may still need to wear orthotics after surgery. Written by HealthInfo clinical advisers. Endorsed by orthopaedic surgeon, Canterbury DHB. Page created February 2017.